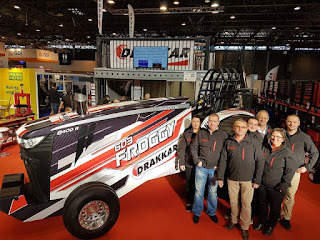 The CDH Pulling Team from Bernay in France, together with their sponsor Drakkar have reveal the new Froggy Limited Super Stock Tractor at the Agricultural exhibition Sima in Paris, France today. It´s a completely new Component Tractor with a new John Deere 8400R hood. The reveal of the new machine was shown live on their facebook page at 10am (CET) this morning. The new John Deere Component Limited Super Stock can be seen at the Drakkar booth until 28th of February 2019. 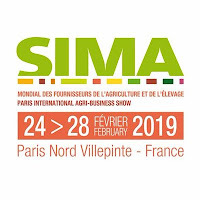 The booth of Drakkar is located in ,,Hall 3´´ ,,Section D075´´. 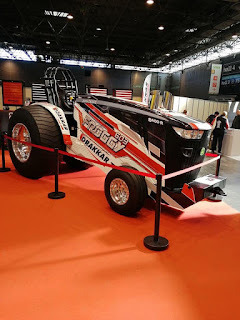 Further information about the new Tractor in the next few weeks, check here at pullingworld.com. Rob Rasnake (Ras-neck) of German descent, is the announcer for the Ocala Winter Nationals Ocala Florida. This is a fairly new indoor pull and shows serious promise. If you stayed up and watched our Live Streams on Facebook with 100,000 others, you saw how the smoke system works. Promoters, vendors, and fans have said if they take the smoke away, we aren't helping out and coming back! Talk about love for some smoke! So smoke is what you get. 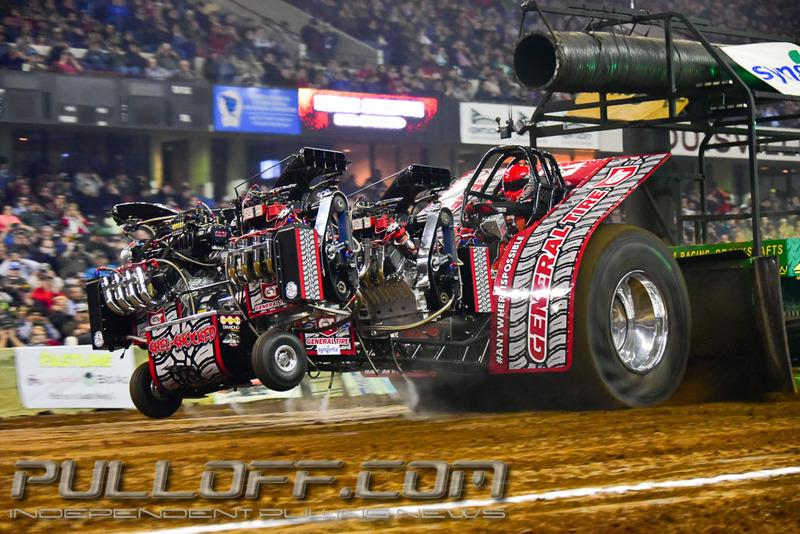 My only regret is that I was not there when they had swamp buggies turned on in between hooks to get the smoke out. 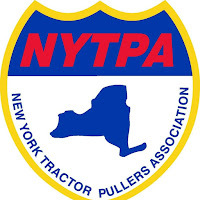 I was picked up in a commuter lot just off of I-95 by a Kenworth W9 hauling three Light Limited Turbo Tractors. Locals call them slug lots. You have drivers and slugs. A driver picks up the number of slugs they desire to make a minimum of 3 people in a car so they can avoid paying a ridiculous toll. At night we didn't have to worry about tolls. So we loaded up the couple hundred pounds of camera gear and luggage and we were off. It took 700 miles and 11 hours to get to this pull. I did none of the driving. Back to Rob fellow, he pulls in a 2050LB Small Block Mini Rod class. This class is all about family something I know puller the world over can relate to. Rob's family came over to settle down in Glade Holland Virginia. 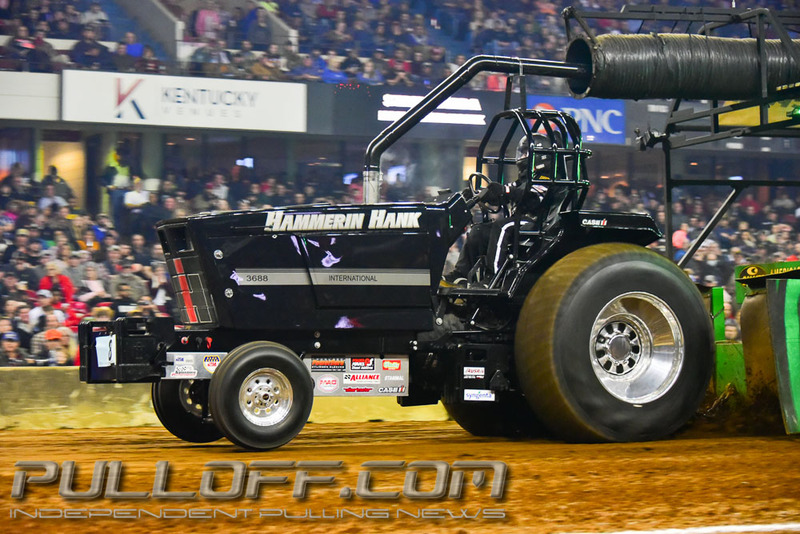 He bought his first pulling vehicle and paid $1100 bucks in high school and "all the parts came in 2 five gallon buckets, No $%^!" he says. The block was in the truck. He bought it from a friend of his. It was in 5 different colors. It didn't have a tailgate. 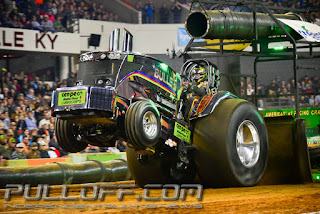 It was a hillbilly of a truck as anything you could ever imagine. Rob told me this was, "The truck to put to moves on the ladies in this truck!" As it progressed through the years, He said, "I really wanted to pull. So I drove the truck to his buddies place and ratchet strap weights down with the weights on the truck. Then I would drive the truck to the local fairgrounds. Every time I hit a bump the rear end would come up. I was a nuisance to everybody on the road. So I wanted to get a little bit more serious. 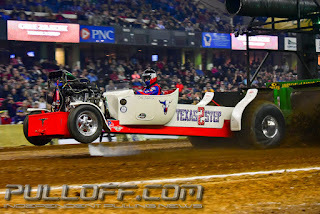 I decided to go the way of Pro Mod 4x4. I called Mike Pervis and he had just opened his Welding Shop and we started to work. Mike sponsored the vehicle and the sticker is still on there from 2002 on the rear fender. It hasn't been painted since. 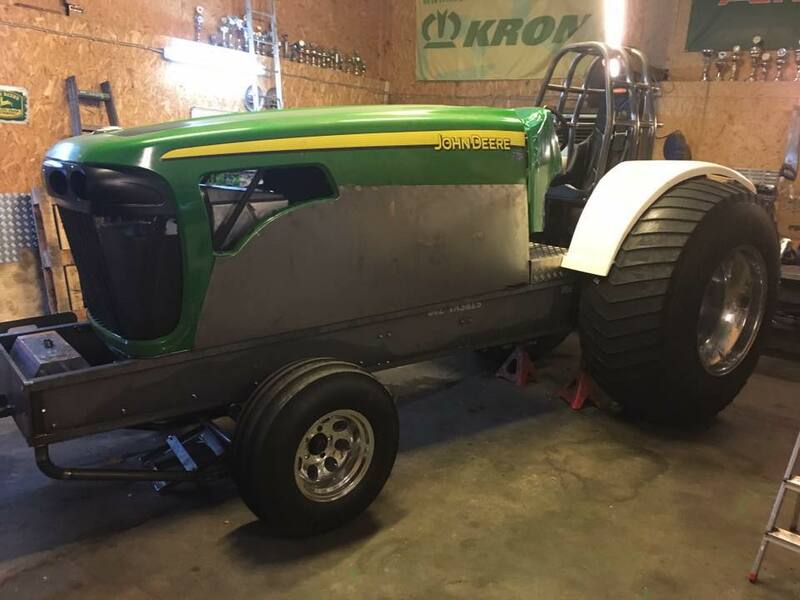 It says, "Built with genuine John Deere parts!" Rob ended up selling the truck to John Edwards, who can be seen in our Super Stock 4x4 videos on our channel. 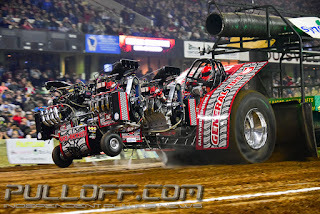 Rob said it was the worst because we spent so much money to go pulling with it and be competitive. There is Tommy Corsa in the truck. There are the Holmans in the truck. Roy Everett is in the truck. So many people pitched because let's face it, how many 20-year-olds want to go pulling and have the funds to attempt to do it on their own. Well, Rob toured the country making hooks on a national level. 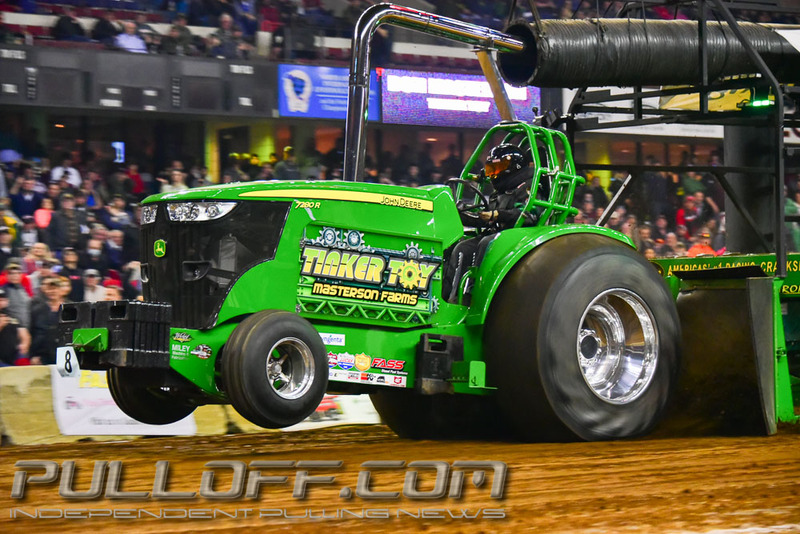 "Getting the NTPA certification was huge a moment for me", he says. He continued, "It got a point where was I spending way too much for my budget. So Johnny bought the truck as a rolling chassis. Johnny changed the hand throttle as well as the transfer case. Everything else was all me!" Rob got his mini rod and found the word Gambler under 5 layers of paint. He picked up the mini rod from a man named David Bess. He came up with the name from his granddad. His granddad was a correctional officer that everybody called Snake. Rob has a tattoo to pay homage to his granddad. So Striking Distance came from him. So when his granddad passed away in 2005, He added to tattoo to include casting a line as well as a cross to remember him by. So what you have in this mini rod is intricate detail to make the hooks, move some weight, attach to anything with a hook, and book down the track. "I want to help grow this class to a national level", he says. Rob said, "My hands shake like you wouldn't believe every time I drive the mini rod!" Rob says that this is a class where most people have 65% of whatever they need to build one. We hear you, Rob. We think this IS COOL and here are your 15 minutes of fame. Well 7:28, but who is counting? And really just 4:00 if you take out the Unlimited Mini Rod at the end. I wanted to take a few seconds and say, "PHEW!" Learning a thousand pullers is tough. Learning another thousand that live, speak, spell differently has been the best time of my life. I am a Google and Facebook machine. It is like the kid who just found out about social media and is trying to get caught up. 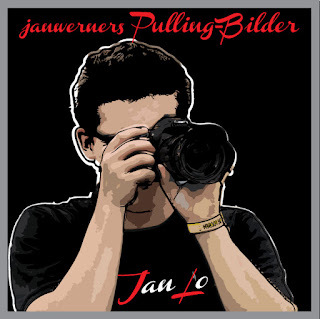 But with pulling abroad, I have known the pullers and most have been my pseudo-friends on Facebook for years without my prior knowledge. Back 4 or 5 years ago, I just thought a friend request with a tractor in their profile pic was cool. Now I think it as vital and consider it a huge honor to connect fans from my corner of the world to all others. 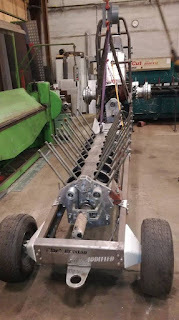 Now I am building deep roots with pullers abroad like I have in my area! I hope you enjoy what we are doing. We have the know how to bring pulling from around the world to your home, mobile, device, shop and hope to continue doing so with the professionalism that has endeared me with pullers here for the last half dozen or so years. My kids just did a challenge in school. The challenge was to Google your last name and see what comes up. My son said his friends were amazed at how our name was the first in Google, Bing, Yahoo, and that we even had a 5-star rating. William told me, "Dad, you are more famous than news people that have the same name!" Will, I call him that, I said, "We deliver news, important news, pulling news!!!" Check out this new Team from Luxembourg! You Hooked What to the Pulling Sled??? 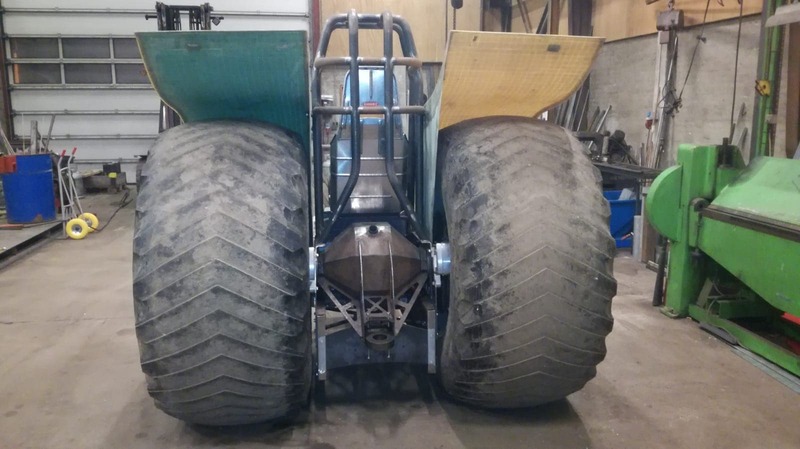 From Visby in Denmark, the Krone Hulk Pulling Team around Claus Fey and Ulrik Gehrt are currently building a new 4.5t / 9920lbs. 8020 series John Deere Farm Stock Tractor on Component base. It's currently the first Component Farm Stock project in Denmark. After many years with the old John Deere Farm Stock Tractor called "Krone Hulk", they decided in the fall of 2018 to built an almost completely new John Deere tractor on Component base. But why have Klaus, Ulrik and the rest of the Team decided to built a new a new Farm Stock. 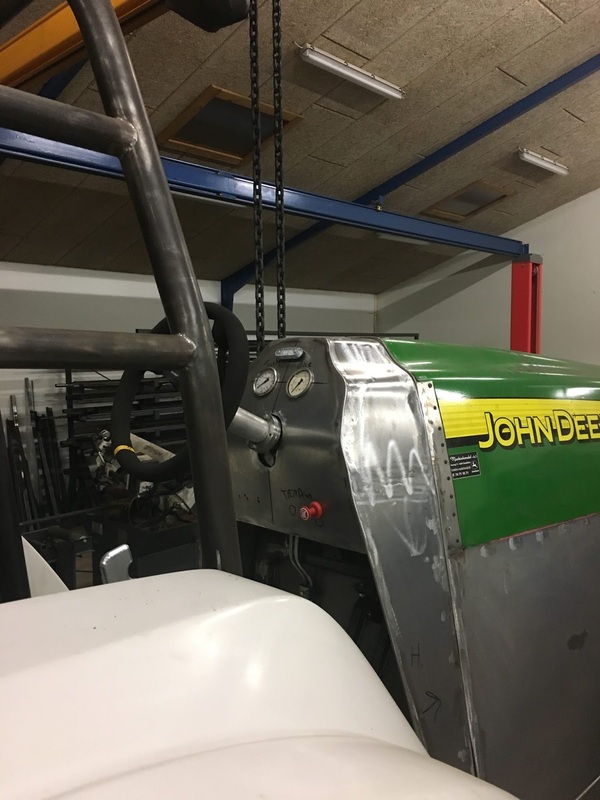 After 10 wonderful years with the old Krone Hulk, the John Deere stock rearend and gearbox were on their limits, which made it impossible to develope the tractor further for the top of the Super Sport / Farm Stock division in Europe. 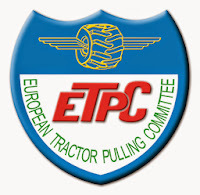 In 2018 the ETPC Tech & Safety Board allowed to built Component Tractors for the 3.6t and 4.5t Farm Stock / Super Sport division in Europe. To be competitive on European level, was the only way to build a tractor on Component base. Also a Component Pulling Tractor is much lighter compared to an normal Pulling Tractor. 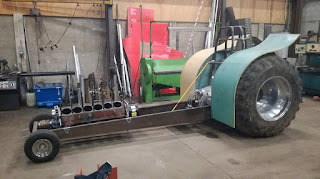 After the old Krone Hulk was sold, the Team started with the building of the new machine in October of 2018. 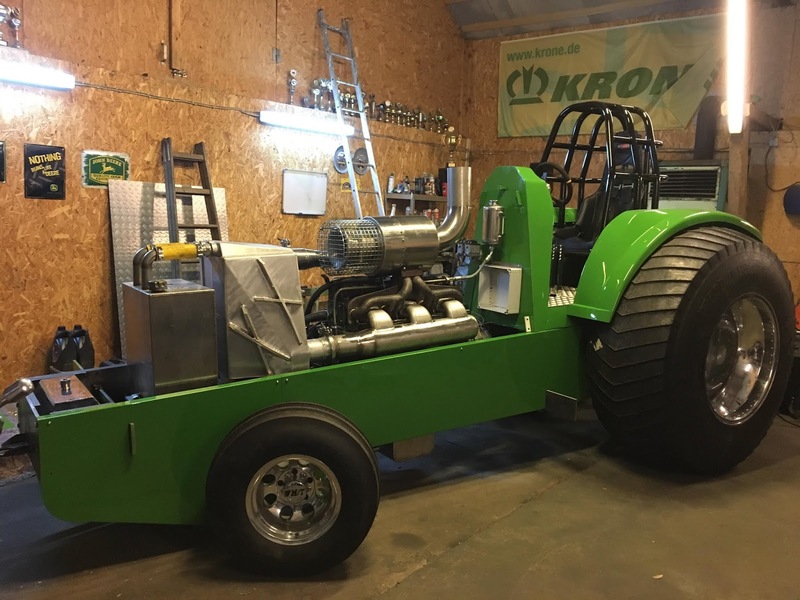 The new Krone Hulk 2 receive a completely new Domex 700 wedge frame with a chrome-moly rollcage, a homemade hydraulic power steering with parts from a Boat, new constructed weight and engine brackets, steel wheelie bars and a machined Scania 81 semi truck rearend. On the new chassis the drivers position is lower, the engine position is more forward and the center of gravity is lower. The Team hopes to get a better balance with this new chassis under difficult track conditions. 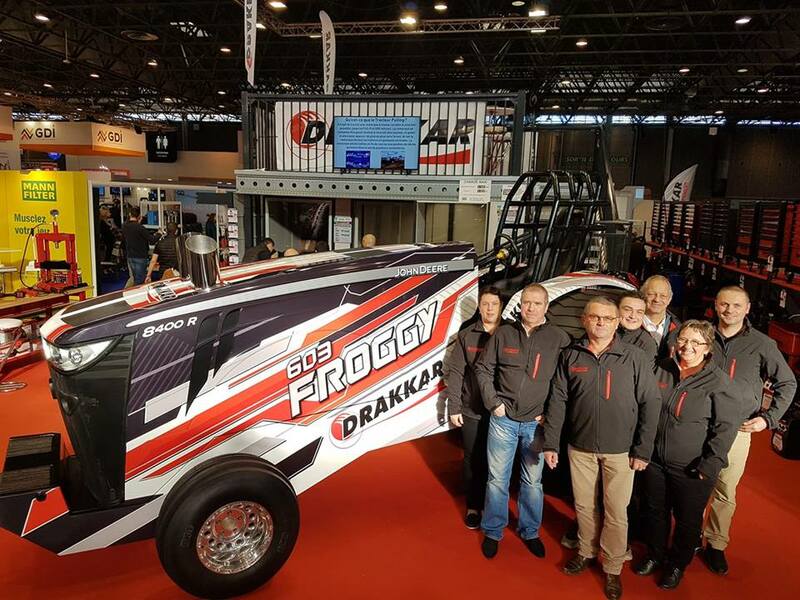 The new Domex wedge frame with the Scania rearend was built by the Hilvsom Pulling Team from Hobro, in Denmark and Emil Roth of the Nasty Toy Pulling Team from Ljungbyhed, in Sweden has constructed and built the new rollcage for the tractor. The Scania rearend was shortened and received a original Scania 81 center section with a modified stock needle bearing diff from the John Deere Pulling Team from Thy in Denmark, a Scania ring and pinion gear, aluminium planetaries carrier housing with Hanomag 55 wheel loader planetaries and Engler Machine & Tool brake calipers with steel brake rotors. 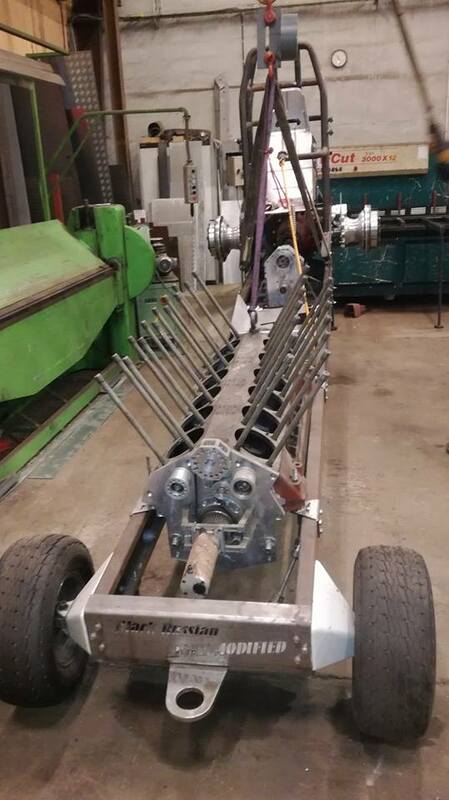 The new aluminium planetaries carrier housing for the rearend also were made by the Hvilsom Pulling Team. The Danish Team decided to give the new Component Tractor a old John Deere 8020 series hood and new lightweight fenders from the John Deere Pulling Team. 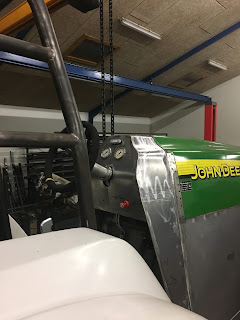 The hood of this John Deere series was built between 2001 and 2005. 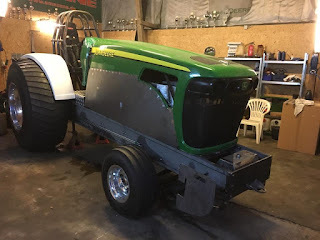 All the sheet metal work on the hood and the tractor were made by the Team himself. 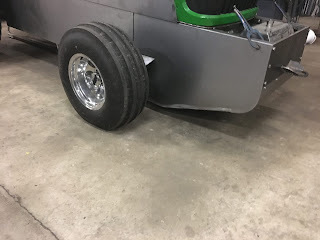 The new vehicle also gets a Profab 4 Speed HD transmission with a Profab driveline, a 11" inch centrifugal clutch with 4 discs from the Bukke Bruse Pulling Team (2008 & 2009 European Champion in the Pro Stock class), a steel fly wheel from the John Deere Pulling Team and a new Browell steel clutch bell housing. 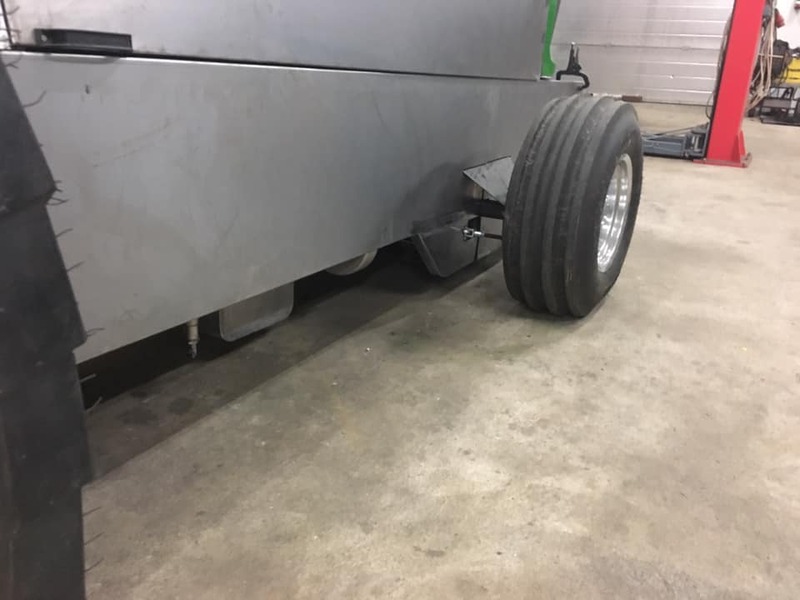 For a perfect traction on the Danish and European Pulling tracks, they purchased a set of new polished Midwest aluminium rims with new cut Firestone Puller 2000 HP tires. The new tires were cut by the John Deere Pulling Team in Thy, Denmark. The new Krone Hulk 2 will have a 6 cylinder turbocharged John Deere 6466 engine with 8.3l displacement on diesel fuel. The engine was taken over of the old Krone Hulk Farm Stock. 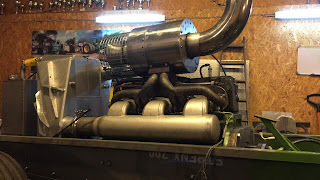 The power plant has a machined JD 6466 cast iron block with Darton sleeves, a revised JD 55 series cylinder head who was machined and flowed by Arne Larsen of the Dingo Pulling Team, original JD valves and GMS valve springs, a billet camshaft by Jan Burggraaf (New Generation), a billet steel crank with modified GMS (Gene's Machine Shop) billet rods and GMS billet pistons from the John Deere Pulling Team, a intake and exhaust manifold of the Red Lightning Pulling Team from Denmark, a billet Holset HX82 turbocharger from the John Deere Pulling Team, a billet diesel fuel injection pump with 14mm elements built by the Dingo Pulling Team, a homemade fuel tank, a Aviaid oil pump with Oberg filters, a Bell alumimium Intercooler and a RPM data logger. The Hulk Pulling Team will compete in the Danish Championship and on some pulls outside of Denmark this year. 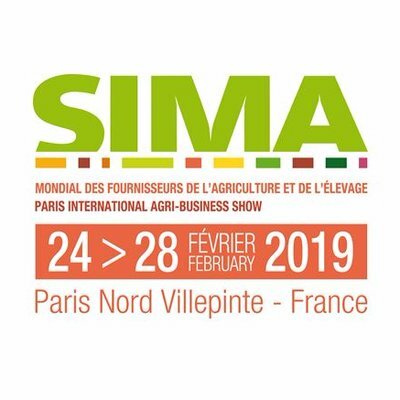 The maiden voyage of the new John Deere Component Farm Stock is planned for the 16th of March 2019 at the European Superpull in Ahoy, Rotterdam, the Netherlands. The Black Russian Pulling Team from Lolland in Denmark are currently building a new Transmash V12 powered 5500lbs. 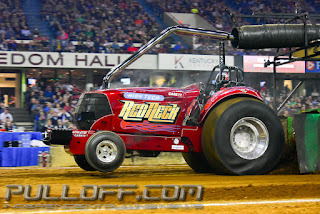 / 2.5t Light Modified Tractor. After many years in the 7700lbs. 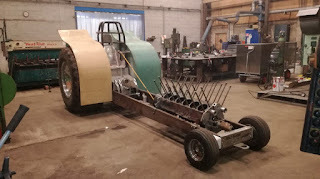 / 3.5t Modified class, the Danish Team decided to built a new Tractor for the lighter Modified class. After the sell of their old Tractor without the engine, the guys started with the new project in October of 2017 in their workshop in Lolland. 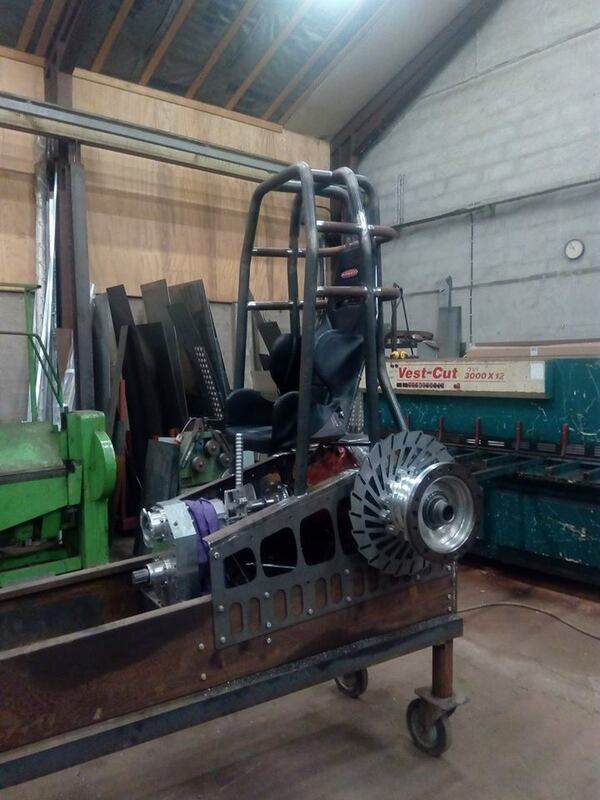 The new Black Russian receive a new homemade Domex wedge frame with a new self built steel rollcage, a Kirkey driver seat, a homemade steering, completely new constructed engine brackets, new homemade wheelie bars and a completely new sheet metal rear axle housing. 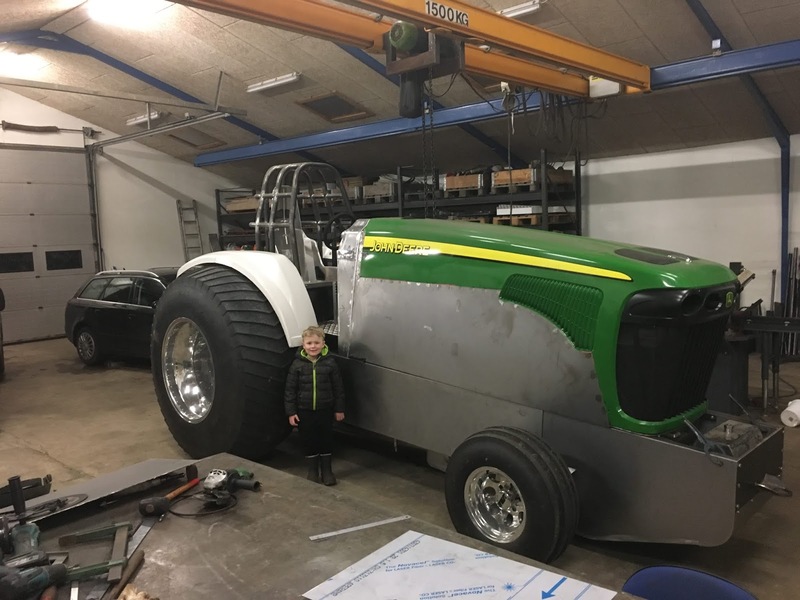 The front axle and the front wheels come from the old 6 cylinder DAF powered Light Modified Tractor called ´´Brothers Toy´´ from the Netherlands. The new rear axle housing was built by the Gladiator Pulling Team from Denmark. 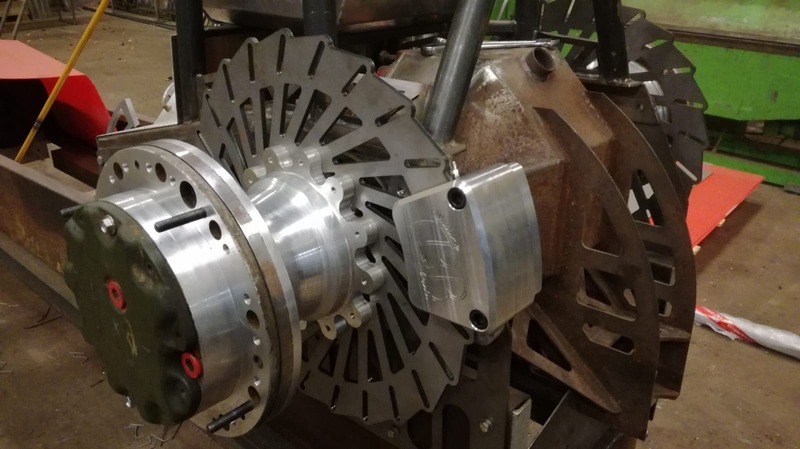 The rear axle will have a Scania center section with a modified Scania diff, a Scania ring and pinion gear, homemade aluminium planetaries carrier housing with Mercedes planetaries and homemade aluminium brake calipers with laser cut brake discs. The new fenders on the Light Modified Tractor were made off glass fibre. 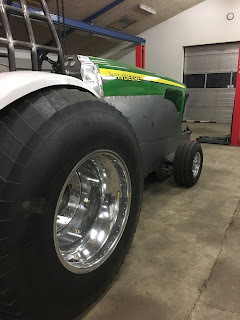 The fenders were also built by Gladiator Pulling Team and are much lighter than the old sheet metal fenders on the old Modified Tractor. 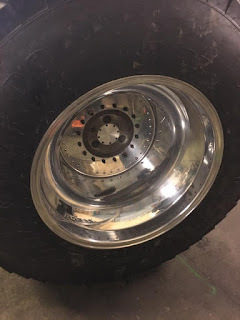 The Danish Team will use on their new vehicle a set of used Midwest aluminium rims with old Firestone All Traction 10 Ply Puller tires. Also completely new is the drivetrain of the Mod. 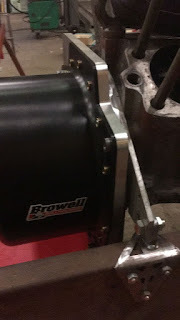 The new drivetrain has a used special built reverser with a special built gearbox, a homemade driveline, a 11" inch Molinari centrifugal clutch with 4 discs and a new Browell aluminium clutch bell housing. 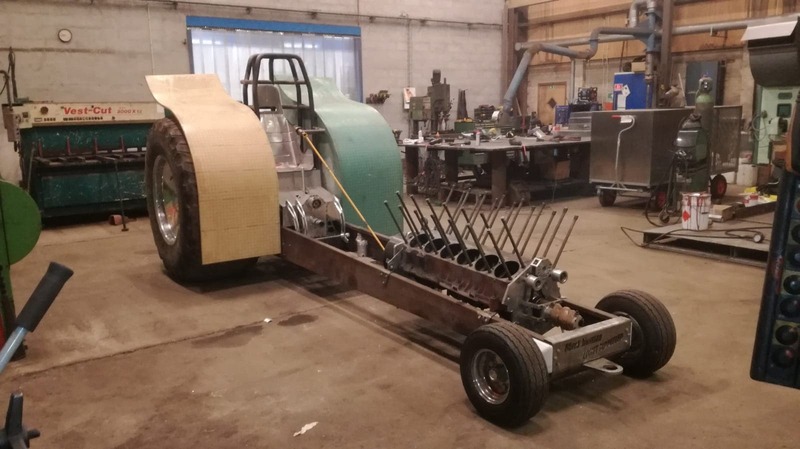 The reverser and gearbox have a CNC-milled aluminium housing and come from the old Transmash V12 powered Light Modified Tractor called ''Another Russian Invader" of Herman Staal from Voorthuizen in the Netherlands. 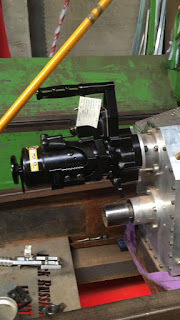 On the gearbox they can attach the starter for the engine. After the starting of the power plant they can take away the RCD starter on the gearbox. Without the starter for the engine they can save very useful weight on the Tractor for movable weight. The new Black Russian will have a turbocharged Transmash V12 tank engine on methanol fuel. 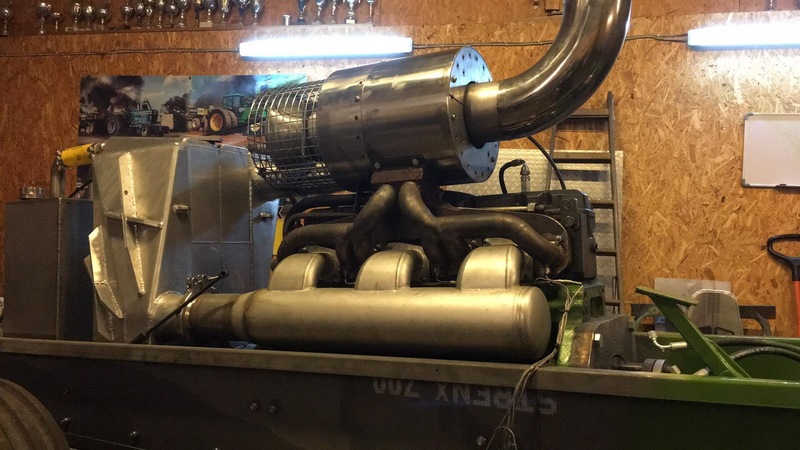 The engine isn't new, the power plant was used before on the old 3.5t Mod in the past, but will receive some changes and little improvements. The engine has a machined Transmash aluminium block with original sleeves, a Transmash crankshaft from a 6 cylinder engine, original steel rods and pistons, machined Transmash heads with bigger valves and better valve springs, homemade aluminium valve covers, stock camshafts, a homemade aluminium intake and stainless steel exhaust manifold, 2 Holset HC5A turbocharger, a special constructed camshaft belt drive, a Aviaid oil pump, a homemade fuel tank, a VSP (Veldhuizen Special Products) methanol fuel system with a Waterman fuel pump and a MSD 8 Dual Coil ignition. 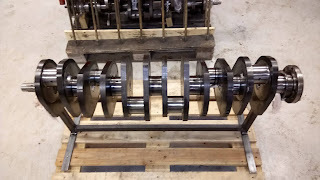 Some new parts like the belt drive for the camshaft of the power plant were also purchased from Herman Staal in the Netherlands. 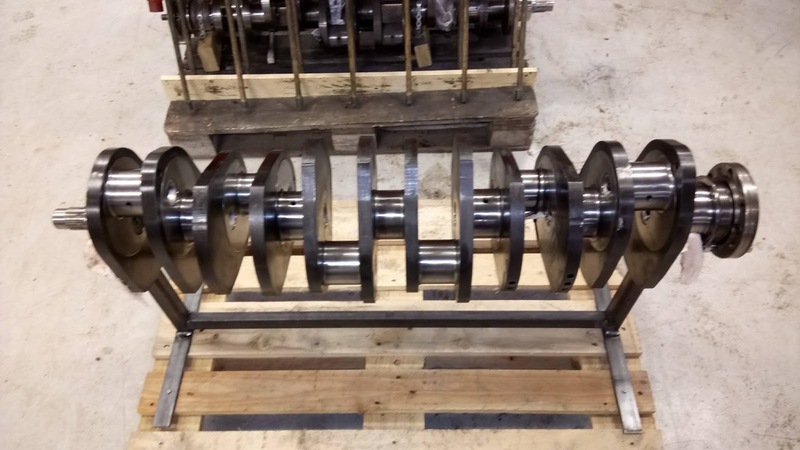 But why they have chosen a crankshaft of a 6 cylinder engine? 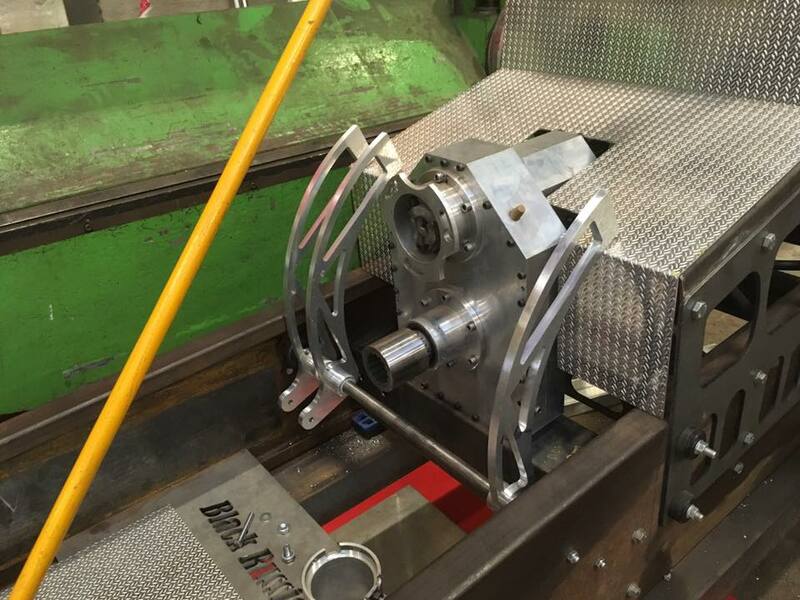 The 6 cylinder crank fits into a 12 cylinder Transmash engine and has originally counterweights. 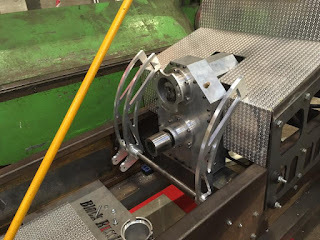 With those counterweights on it, it's easier to balance the crank again on a balancing machine. The Team construct and build the most of their parts himself. That's why project needs a little bit more time. 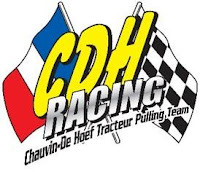 For the future the Black Russian Pulling Team has planned to compete in the Danish Championship. 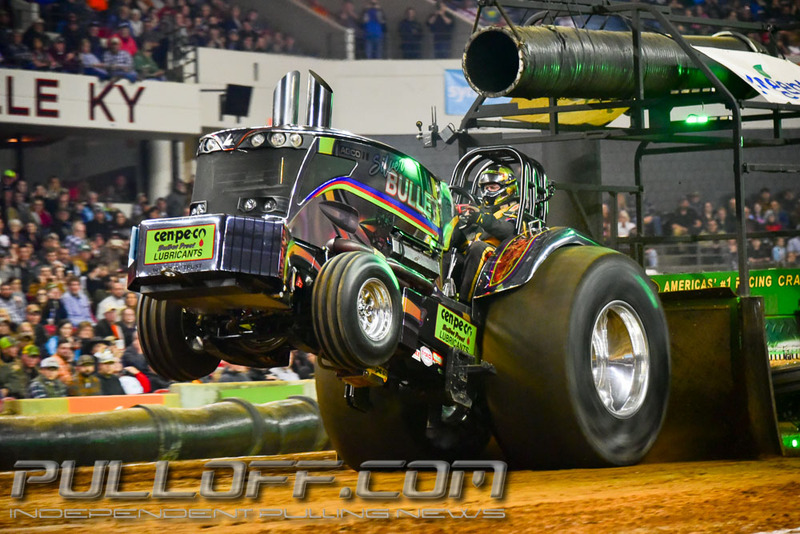 The maiden run of the new Light Mod is planned for the 2019 season. Euro Cup Competitors 2019 are known ! 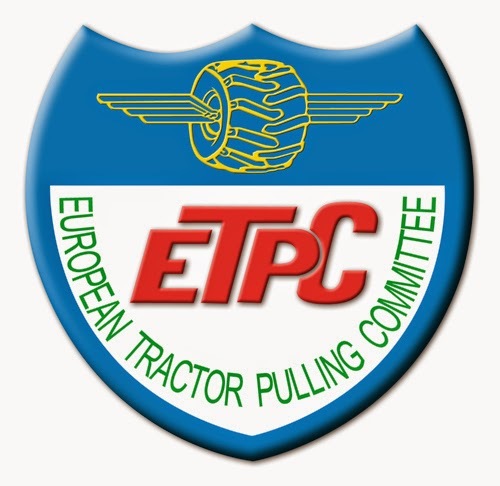 Last week the ETPC has released the competitors list for the 2019 Euro Cup season. 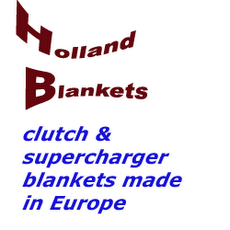 A total of 63 competitors from 9 different European countries have registered in 5 classes. 17 in the Light Mod class, 14 in the Super Stock class, 13 in the Mini Mod class, 11 in the Pro Stock class and 8 in the Heavy Mod class. The Euro Cup season kicks off at the 27th and 28th of April 2019 in Füchtorf, Germany with the Mini Mod and Heavy Mod division. All my photos without effects or cutting! All photos are original! Photos are not in high resolution! 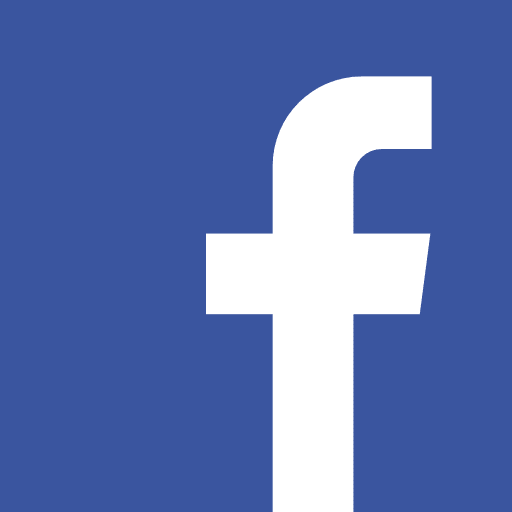 You want to use some photos for your facebook- or your website?